Watch history unfold as the past comes to life and captures the reader’s interest! Golden Legacy is a classic collection of 16 inspirational volumes. 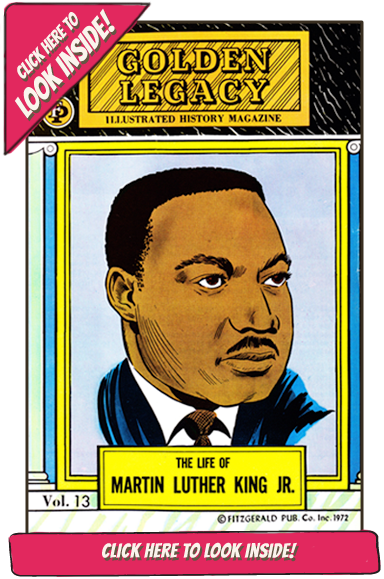 Each volume contains 32 colorful pages and is a fully illustrated, biographical account of many significant achievements of Black men and women. It is a widely endorsed new approach to the study of history that utilizes the appeal of the comic book format. 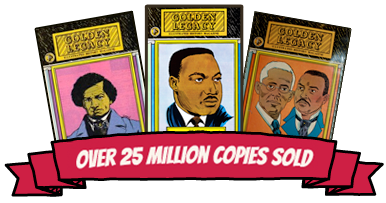 Golden Legacy is fast, has impact and also communicates visually which increases reader comprehension and enjoyment. This high interest level series motivates fast and slow readers to read voluntarily! In addition to its educational value, Golden Legacy performs a valuable emotional and social function. It helps create an atmosphere of harmony and mutual respect between groups. It creates pride and self-esteem while replacing myths with an appreciation for the contributions of others. See All 16 Titles! Buy Today! A fast and enjoyable fully illustrated, new approach to the study of history! Easy-to-read pages motivate voluntary reading by slow as well as fast readers! Ideal for black and integrated classrooms! Creates an atmosphere of harmony and mutual respect between groups. Because of its very high Interest level and content, golden legacy is used in reading classes, language arts and social studies classes for grades 4 through 12.